I want to share one of the ways I quickly resolve slow shower and tub drains at my house. For the last few years, I've been doing a lot of the household maintenance for my family. One of the pain points we run into when my wife lets her hair grow a bit longer is that hair has a tendency to collect in the drain of the tub in our master bathroom. I used to think that the way to solve this problem was to use a liquid drain opener. I searched for one that could completely clear any drain obstructions in one application. I never found the right magic liquid despite trying several different brands, so I decided to search for solutions that involved using a physical appliance like a plunger or an auger. In the course of talking to friends who are handier than I am, one friend asked, "is the problem mainly hair getting stuck in the drain?" I had no idea, so he said, "Maybe you should get a Zip-It, then see if it brings up anything when you use it." I had no idea what a Zip-It was, so I bought one next time I was at my local hardware store. Zip-It is an inexpensive plastic wand with a loop where you insert your index finger at the top, and a series of plastic barbs on both sides of the length of the wand. In order to use the Zip-It, you insert it as deeply into the tub drain as possible, then pull the wand completely out of the drain. I tried this, and it immediately pulled up a hand-sized ball of hair along with some soap scum that had collected on it. I found that this sort of hair ball develops in our tub drain about once a month, so I put a recurring task in Todoist to use Zip-It to clear the drain. The result is water freely-flowing through our tub drain on a consistent basis. Zip-It and its competitors are advertised as disposable, but I reuse the original one I purchased by simply removing the hair from the wand, throwing the hair in the garbage, washing the Zip-It under the faucet, and hanging the Zip-It up to dry. From my experience of a few years, this Zip-It might last a lifetime. It's among the best $7 I've ever spent in terms of value for my money. Jason Snell does an impressive job documenting the changes to podcast feed formatting that Apple is rolling out in iOS 11. He's one of the people who has a big stake in the podcasting game, and I trust him to understand the details of what these features are and why they are important. When a home run lands in the outfield stands-- or perhaps hits a pole or façade-- the ball stops moving at a point elevated from the field level, sometime by as much as 200 feet. To figure out how far a ball would have traveled if unimpeded-- and therefore get the "true distance" of a home run, we need the exact trajectory the ball took and then extend that to field level. One of the more interesting analytical pieces I've read about how baseball statistics have changed in the IoT era. Business Insider tells the story of the Cannondale-Drapac Pro Cycling Team and their huge achievement of winning Stage 9 in the 2017 Tour de France with their General Classification rider Rigoberto Urán. First of all, writer Daniel McMahon is totally correct when he refers to Cannondale-Drapac's strategy is akin to the strategy of the Oakland A's in the Michael Lewis book Moneyball: The Art of Winning an Unfair Game. The Cannondale-Drapac team reportedly runs on a budget of about 1/3 as much as the defending champion Team Sky does. Rigoberto Urán is the only rider on Cannondale-Drapac that is said to be earning the equivalent of $1 million annually, and the total athlete salary budget for the team is approximately equal to the salary of Peter Sagan, the current World Champion of road cycling. But beyond that, the analysis of of the three U.S. pro cycling teams is quite interesting-- such as how each of those teams is owned or sponsored by companies that are "endemic" to cycling. By this the author means the bicycle manufacturing brands of Trek, BMC, and Cannondale. Johnathan Vaughters, a former Pro Tour rider himself, is now the CEO of Slipstream Sports, the company that operates the Cannondale-Drapac team. He very clearly states that his team faces an existential threat in the sense that it can barely operate at the Pro Tour level because of how poorly it is funded in comparison to the European Pro Tour teams. If you love the sport of cycling, or if you love European-based sports in general, you need to read this article. It shows how much the sport has changed from the perspective of the American teams since Lance Armstrong was forced to admit that he used performance-enhancing drugs. A company in Switzerland called Fairtiq has an iOS app with support for the Apple Watch that lets you pay for transit tickets using your Watch. The way it apparently works is you start the trip on your Watch as you board the bus (they also have partnerships with rail carriers), and end the trip when you leave the bus. The iOS app automatically calculates the fair and pays for it, based on geolocation of the start and end points. Fifteen years ago this week, Steve Jobs gave this pre-opening tour of the first Apple Store in Tyson's Corner, Virginia. If I said to you in 2001 that Apple Stores would become the fastest growing boutique store concept in retailing, that in the future the presence of an Apple Store would be the best indicator of mall viability, and that millions of people would visit Apple Stores to buy handheld devices that not only redefined their relationship with technology, but also became the primary means of conducting large parts of their business and personal lives, you probably would have called me crazy. I probably wouldn't have believed it myself. And yet, looking at this video posted on YouTube, you have to admit that almost every aspect of the Apple Store concept that Steve Jobs shared with us is still alive and well today. Sure there are a few differences. The iPhone didn't launch for another six years, and no one could have predicted its impact on the product mix at Apple Stores in the future. As a result of the iPhone, Apple no longer needs to carry video cameras or digital cameras. The iPhone subsumed those devices. The significant floor space devoted to boxed software is also gone from Apple Stores. The App Store for iOS and Mac OS X is where we look for software these days. But the vast majority of the concepts Steve showed in 2001, the display space in the front of the store totally devoted to Apple products, the Genius Bar, the areas of the store where solutions are displayed with Apple products and now services being at the center of the solution, all of that still exists and has stood the test of time. The Apple Store, showing people the possibility of a new technology-centric lifestyle, probably did more to make those of us who work in technology part of the mainstream than any other recent societal evolution. Now even if building software-- we call them apps today-- doesn't make you rich, it makes you one of the cool people in the eyes of your kids and their friends. Thank you Apple. Thank you Steve. Thank you Ron Johnson for making the dreams of so many come true. My friend Dave Mark from The Loop reminded us of this anniversary this morning, so I can't take credit for the idea. But I can talk about it. 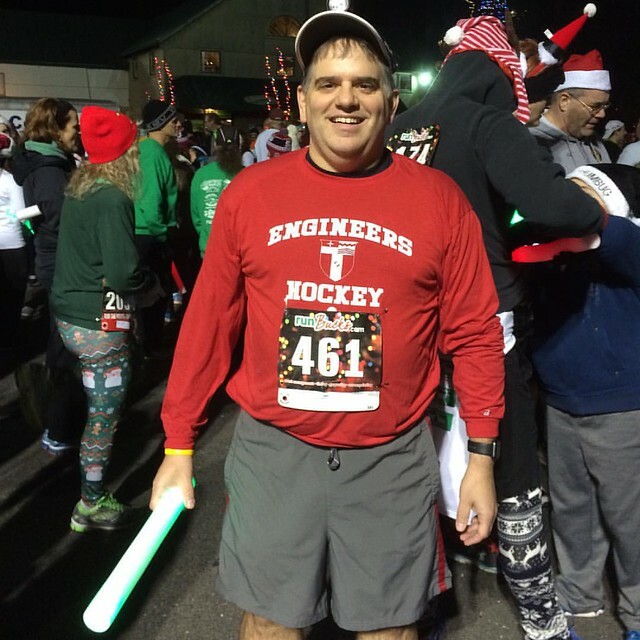 On the Friday before Thanksgiving, I ran a race called Run the Lights at Shady Brook Farm in Yardley, PA. This was a two mile run along through a farm field that is lined with large Christmas and Hanukkah light displays. The race began at 7pm, long after the sun set. The entire point of the race was to appreciate the lights in the dark. But some people were running the race and not walking it with friends and family, and there were stretches of the course where the holiday lights were not bright enough to light the course. So each runner was provided with a battery-powered glow stick, like the one I'm holding in the photo. I wore a mountaineering headlamp over my baseball cap, which you can see peeking over the brim. But even that was not enough light to be sure of my footing in the darkest parts of the course. Since I crossed the finish line from that race, I've been looking for lights to supplement my headlamp in a night cross country race. I think I've found a good solution in these Knuckle Lights that put 45 lumens of light on each hand, which is ideal for several reasons in a race like this one. The conditions in this race were ideal (41 degrees Fahrenheit, 49% humidity, 3 mile per hour winds), but if the conditions had been colder, I would have wanted to wear gloves. Knuckle Lights would work well if runners were wearing gloves. When running in a race where you are supposed to be admiring Christmas lights, I naturally turn my head left and right to look at the lights I'm passing. When you are wearing a headlamp, the light shines in the same direction as you turn your head. Knuckle Lights continue to point forward because my hands would not turn as head turns. Finally, if the only strong light source I'm running with is a headlamp, I have to constantly position my head in a way that shines the light a good distance in front of my feet. With Knuckle Lights, the angle of the lights would be closer to the ground and likely to be more parallel to a level surface. I think these lights would be great for next year, and I will definitely try to get a set of them. Good morning. Today I'm kicking off a new weblog called Operation Gadget that will talk about electronic gadgets, software, and related products. I realize that this is not virgin territory in the blogosphere, but, I definitely think there's room for a little friendly competition in this space, and you'll see some features added to Operation Gadget that I think are fairly unique. My name is Dave Aiello and I have setup and run a series of weblogs over the past three years. The largest one, and where I have done the majority of my posting until now is CTDATA.com, my consulting firm's main website. Operation Gadget is the first weblog that I've built to cover an editorial niche, and I've had a good time designing it. I was the first guy in my neighborhood with an Apple Newton MessagePad, a TiVo, and a Handspring Treo, so I've picked my share of winners and losers. If you were interested in those products when they came out, you'll probably be interested in the stuff that will be published here. I'll do my best to keep the main content informative, and I welcome your comments, questions, and tips. I've written over 1800 articles for this site, and writing for it has been a lot of fun. I want to thank my wife Kathleen, my son Jimmy and Peter, and the rest of my family and friends, for supporting this site and encouraging me to continue to write for it when I have time. I drive a GMC Acadia that has a built-in entertainment system, so my sons can watch DVDs when we're driving on trips of more than an hour. This was a great purchase for them. It also gives me an 110 Volt AC outlet which I can use to charge an iPhone using the standard iPhone adapter. However, the outlet has relatively low power output, so charging takes a pretty long time. The workaround for this was to purchase a car charger that works with the 12V DC outlet, which has the potential to work faster. When I first wrote this article, I recommended the Incase High Speed Dual Car Charger. This was a device that charged two iPhone 5s smartphones faster than the standard iPhone charger does when connected to my SUV's AC outlet. Our current recommendation is the Anker Quick Charge 3.0 39W Dual USB Car Charger. This charger is even faster than the Incase High Speed Dual Car Charger and uses the fastest charging modes supported by Apple, Android devices made by Samsugn Galaxy, LG, HTC, Sony, Nexus, and Motorola. These modes are Quick Charge 3.0, PowerIQ, and VoltageBoost. I've recommended the Anker Quick Charge to friends because it does such a good job at rapidly charging one or two iPhones. Some people look at Amazon.com's vast selection of 12V USB chargers and choose a less expensive model. Please note that some of the 12V USB chargers sold are not sufficiently shielded for Radio Frequency (RF) interference. As a result, they can create a hum that's audible on your car's stereo. The most significant part of the recent announcement of the iPhone 6s and 6s Plus was the introduction of the iPhone Upgrade Program. This is because it allows iPhone customers, for the first time, to lease unlocked iPhones directly from Apple, finance them through Apple1, and get away from the two-year subsidized purchase contracts with mobile carriers that have kept iPhone customers paying inflated rates for mobile data and cellular service. A lot of customers who looked for ways to finance their new iPhones in this purchase cycle were disappointed that they were being asked to pay monthly as a separate line item for their new handset. But this separation of phone financing from mobile service is already putting pressure on AT&T and Verizon, who charge the highest rates for post-paid mobile service in the United States. This means that the 16 Gigabyte iPhone 6s can be financed for $32.41 per month for two years, regardless of which of the big four U.S. mobile carriers you choose to use (AT&T, Verizon, Sprint, or T-Mobile). iPhone customers who choose the iPhone Upgrade Program can seek the lowest service rates available from these four carriers. If you upgrade to an iPhone 6s or 6s Plus, you should seriously look at financing using the iPhone Upgrade Plan or paying for the phone outright, if you can afford it. This gives you the greatest negotiating power with carriers, and gives you the option of paying for service on a month-to-month basis. That's Fantastic, So Why Haven't I Upgraded? The problem with the iPhone Upgrade Program right now is that customers must choose between AT&T, Verizon, T-Mobile, and Sprint, which are the four largest post-paid mobile carriers. If customers were allowed to choose from the non-branded, pre-paid carriers, the monthly savings on mobile service would be even greater. My wife and I decided not to upgrade our iPhones (a 5s and a 5), let our two year agreement with AT&T expire, and we were able to get our monthly bill down from about $145.00 on an AT&T Mobile Share Value plan to $80.00 on Cricket Wireless' Bring Your Own Phone plan. This means that my wife and I should be able to stay as customers of Cricket and be able to afford to finance two 16 Gigabyte iPhone 6s phones through the iPhone Upgrade Program at nearly the same cost we were paying for service alone with AT&T two months ago. The drawback is that right now Apple doesn't let us choose Cricket. We have to choose one of the big four branded carriers, all of which are more expensive. Who is Cricket Wireless Anyway? A lot of middle-class U.S. smartphone users probably aren't even aware of Cricket Wireless' existence, but they are the pre-paid mobile service subsidiary of AT&T. This means that I keep almost all of the features of AT&T, including the exact same coverage areas, and pay about $65.00 per month less than I did by being a post-paid AT&T customer. But for $65 less per month, I can deal with these features being missing. Best of all, if I ever decide I need tethering, pooled data or somewhat higher throughput, I can switch to a carrier or a plan that provides it at the end of my current monthly billing cycle. I don't have to stay with Cricket more than 30 days because we pay as we go. Who Are the Other Pre-Paid Mobile Carriers, and What's the Deal with Them? If you are interested, the biggest pre-paid mobile carriers in the United States that are not branded with the big four mobile carriers names are Cricket Wireless, Straight Talk, Virgin Mobile, Boost Mobile, MetroPCS, and GoSmart. Some of them don't provide LTE data plans comparable to the post-paid carriers. Some of them don't support the iPhone. YMMV. We should thank Apple for providing the iPhone Upgrade Program, and for breaking the hold that the mobile carriers have on us if we can find the right month-to-month plan that meets our needs as an individual or a family. 1iPhone's leased through the iPhone upgrade program are technically financed through Citizen One Personal Loans, but this is Apple's choice of customer financing options.